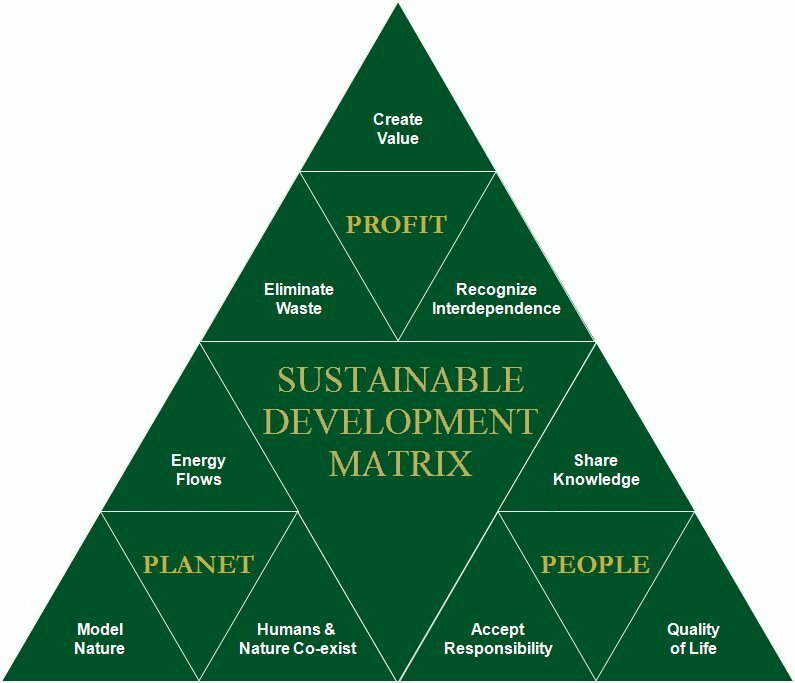 Sustainable development is a process for meeting human development goals while maintaining the ability of natural systems to continue to provide the natural resources and ecosystem services upon which the economy and society depend. While the modern concept of sustainable development is derived most strongly from the 1987 Brundtland Report, it is rooted in earlier ideas about sustainable forest management and twentieth century environmental concerns. The directional orientation or placement of your home on your site is a good way to start. Twenty degrees in either direction from true south with lots of south facing windows. This coupled with calculated overhangs don’t really cost us anymore in most cases. Incorporating a gray-water system to water our plants is a very simple task for a plumber with the right design. Insulating our stem walls will help stop the radiant sun from penetrating our slabs and heating our home during the summer months. There are many manufactures on board that see into the future such as 3M, Dupont, Amoco, Trane, E-Crete, and others that recognize the market value of environmentally sound products. These products need to be specified when doing any construction whether it is a new home or a remodel. Your builder probably doesn’t realize all that is available to him. This is one of the most common problems throughout our community. Most builders use methods and materials that are tried and true to them. It is our duty as consumers and the guardians of our planet to request the alternative. We need to raise the bar of consciousness and demand sensible products and methods. it is our duty as privileged people to get the knowledge to the builder . This will spark the local industry and accelerate a wave of interest. Be proactive there is a lot we can do. Financing programs — called Energy Efficiency Mortgages (EEM’s) — linked to home energy ratings (or enhanced audits) are coming to market backed by US DOE and US EPA technical and marketing programs. Integrating energy improvements into a mortgage quickly helps you pay for these measures. The concept is simple: improve the home to meet an energy rating, and the cost of the most environmental improvements can be included in the mortgage (or refinancing) as long as the average monthly energy savings are greater than the added monthly mortgage costs. Home building needs to undergo a process of technological substitution and rethinking to become more environmentally sensitive and sustainable. In a green housing project, much inefficiency are addressed and overcome, so your home becomes part of the solution. The building industry is acting to incorporate the growing knowledge of green buildings into housing products and services, but consumer demand plays an important role in getting these better products to market. Luckily, our homes can become a powerful tool that empowers us to help protect the environment. When we live in a green home we encourage reducing waste, implementing recycling, using renewable materials and energy sources, and implementing a better way of producing housing. These are the Five-R’s: Reduce, Recycle, Renewable, Reinvent and Rethinking . When our homes are built or remodeled with these important tools in mind, each one becomes an “engine” pulling to help the environment.